Installing the right pallet racking system as part of your storage solution means also ensuring it delivers on employee safety. By maintaining your pallet racking system you not only deliver on employee safety but you are also protecting your investment. Safety begins in the planning and design stage. A designer requires accurate information regarding load dimension and weights to ensure adequate load bearing capacity and to design the elevations. They also need to know what make and model of forklift is to be used as this will determine the aisle spacing between the pallet racking. The racking must be installed as it has been designed by the supplier. Once installed it is recommended that all personnel operating within the warehouse environment are trained in safe working practices. This includes training all forklift operators to ensure they load and unload the racking the correct and safe way. Safe work load signs should also be displayed on visible locations of the racking. The safe work load sign indicates the maximum load for each beam level and also the total bay load allowed for that bay. 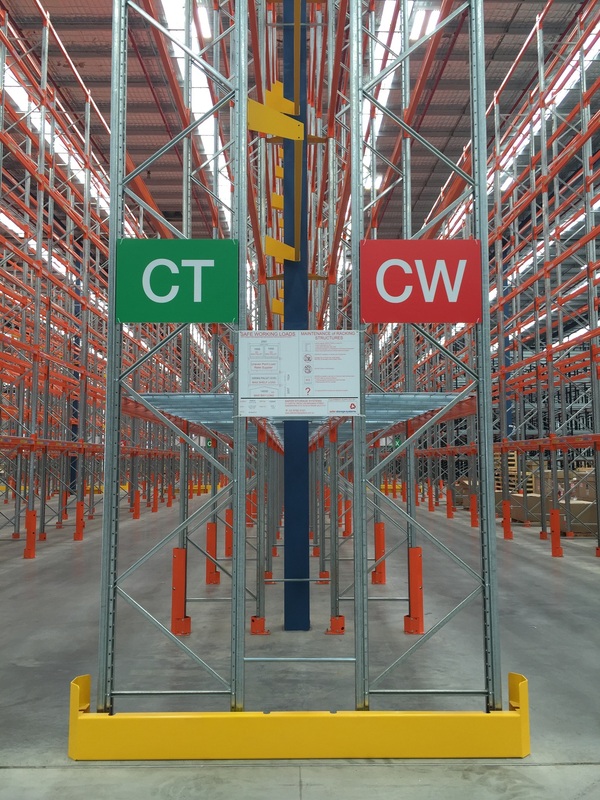 The pallet racking load should be stacked centrally on the pallet, and if overhang has been permitted in the design stage, the overhang should be even on both sides. A change to the rack configuration will cause a change in the load carrying capacity. If you have removed beams or fitted additional beams the load rating will change. Before conducting any changes to the racking configuration, you must consult with the supplier of the pallet racking. Any changes will need to be re-designed to ensure all load carrying capacities are still being met. New safe load signs will also have to be provided, clearly showing what the new loadings are for each bay of racking. It is recommended that a ‘Rack safety officer’ in appointed to carry out routine inspections, and to keep maintenance and safety reports. This person would assess any damage or unsafe practices, and take the necessary actions to help maintain a safe working environment. A major inspection by a qualified person is recommended every 6 to 12 months to inspect and evaluate the condition of the pallet racking. This would include a full inspection report detailing any damages and include recommendations for repairs and maintenance. The most common type of damage to pallet racking is from a collision with materials handling equipment, or from the pallet the materials handling equipment was transporting. Any damage to a rack upright or beam will reduce the load carrying capacity. Any damage incurred, however minor, should be reported immediately to ensure the appropriate precautionary actions are taken.